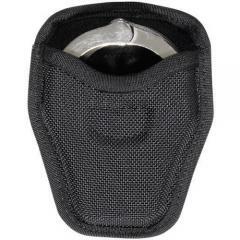 This Bianchi Accumold Cuff case is lightweight yet durable. Holds one pair of standard or linked handcuffs. Check out our other Bianchi Accumold products to complete your duty rig. Good quality but difficult to put the cuffs back in. Bought this a couple years ago. My S&W chained cuffs don't fit well, my hinged set is perfect. Love Bianchi products. Already have one, S&W handcuffs are extremely tight in case. These fit on my son's vest exactly as he thought they would. Will hinged cuffs fit in this holder? This handcuff case fits standard chain linked cuffs only.